We’d love your help. Let us know what’s wrong with this preview of The Warlords of Antares by Brian K. Larson. Betelgeuse star went supernova 640 years ago. The explosion opened an unstable wormhole to Earth. It took all those years for the corridor to stabilized. The Warlord's Emperor sent a scout to investigate the newly discovered life forms, and to bring back specimens for their arena games. Their Antarian blood lust must be quenched...and the Antarian Boreshog beast they must Betelgeuse star went supernova 640 years ago. The explosion opened an unstable wormhole to Earth. It took all those years for the corridor to stabilized. The Warlord's Emperor sent a scout to investigate the newly discovered life forms, and to bring back specimens for their arena games. Their Antarian blood lust must be quenched...and the Antarian Boreshog beast they must face, has never been defeated. The benevolent Eridonians’ mission is to prepare the people of Earth for the coming onslaught. Join Navy Captain Jedediah Fits and USMC Major Race Jennings on their quest to fight Earth's newest enemy. 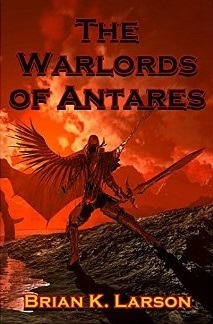 To ask other readers questions about The Warlords of Antares, please sign up. I must admit combining genres like Science Fiction and Fantasy work well for me. The story is pretty straight forward, good guys & bad guys with added aliens, wormholes, nukes and blood. Pretty good mix if you ask me. So to start with we learn about two races of aliens the warlord Antarians and the Eridonians. The Eridonians don't like what the warlords do and want to stop Earth from being invaded. A wormhole the Eridonians have been monitoring is now stable enough for the warlords to traverse I must admit combining genres like Science Fiction and Fantasy work well for me. A wormhole the Eridonians have been monitoring is now stable enough for the warlords to traverse and it leads straight to Earth! Things never go to plan and our heroes end up traveling through the wormhole to rescue some crew members who've been taken hostage. We learn a lot more about the alien races at this point and learn about the bloodlust of the Antarians and the games they hold in their arena. I don't want to give the whole plot away but there's an interesting tale being told with the bloodlust and the challenges our heroes face. I'm a fan of Brian's work anyway. His books suit adults and young adults as well. I think this is mainly due to his writing style as all his books flow well with a decent chapter length and you don't get bogged down in too much detail. The author manages to give the main characters some depth throughout the story and you may find out you like someone you initially thought you wouldn't. Now if you want me to be picky I felt the jump sequence used to travel space was a bit long. You hear it used throughout the book so i would have probably shortened it but that's just me. I guess my only complaint about the book which really isn't a complaint is that it left me wondering what happened next.. I felt the ending of the book was good but i wanted more. Am i being greedy?? I won’t be reading any more of this series. Seems like the work of a high school creative writing class. Really got tired of, and couldn’t see the purpose of, using the word ya instead of you. The work of an amateur. Brian was born and raised in Seattle in 1959. He grew up in the town of Mountlake Terrace, a small suburb north of the city. Brian, being the youngest, had two siblings, his eldest brother, Mike and sister, Pam. School was challenging, as Brian suffers with Dyslexia, a learning disability that affects 1 in 15 Americans. That didn’t stop Brian. He was named "bookworm" in school because he always ha Brian was born and raised in Seattle in 1959. He grew up in the town of Mountlake Terrace, a small suburb north of the city. Brian, being the youngest, had two siblings, his eldest brother, Mike and sister, Pam. School was challenging, as Brian suffers with Dyslexia, a learning disability that affects 1 in 15 Americans. That didn’t stop Brian. He was named "bookworm" in school because he always had his nose in a book. Brian received his MBA in 2010 in Business, now writes for fun, living his lifelong dream of writing science fiction books. He enjoys his off time, with his seventh grade sweetheart, Diana Rose now for going on eighteen years. She has been by his side and continues to supports his writing. Brian says that without her encouragement, his dream would never have become a reality. They now live in Marysville, Washington.